Halloween Activity - Types of Sentences. Use this free Halloween worksheet to practice identifying the 4 types of sentences: naming declarative sentences, imperative sentences, interrogative sentences, and exclamatory sentences. Includes a handout with notes on types of sentences and sentence fluency. 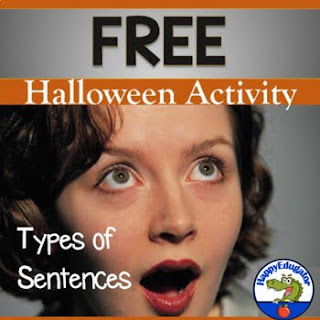 Example sentences have a Halloween theme. Halloween Writing Practice - students write their own sentences of each type in response to a picture from their textbook or from a choice of photos included. Promotes sentence fluency in writing! Happy Halloween! .© Deborah Hayes aka HappyEdugator. For classroom and homeschool use.